During Stamping Saturday over on my Facebook page, I showed off some projects using the Painted Harvest Bundle, and this treat bag was the first. Don’t forget to check back often for the other 3 projects! I love how quickly it goes together, and it’s perfect for all kinds of occasions! Use it at a kid’s birthday, give to your co-workers, or use as place holders at Thanksgiving dinner! Be sure to like my Facebook page so you can join me live for the next Stamping Saturday! Don’t forget to use the current hostess code PUHSXA73 when you place your order to get a thank you card from me at the beginning of next month! Stamping Saturday has come and gone and I am SO excited I was able to share it with some of you! I made two cards from the brand new Eastern Palace suite that is available in a couple of exclusive bundles until May 31st only! I hope you enjoy these projects and join me again next time! Thank you everyone so much for joining me today! This is a re-play the videos I broadcast live on Facebook. Head over to my Facebook page to like my page and get notices for future events and live broadcasts. In Session 2 of Stamping Saturday, we turned to the Weather Together stamp set and made two gorgeous cards! I absolutely love a pop of bright color with our Basic Gray Cardstock, and the Peekaboo Peach looked amazing with it! Don’t forget to take advantage of the Year End Closeout sale, up to 60% off HUNDREDS of products! 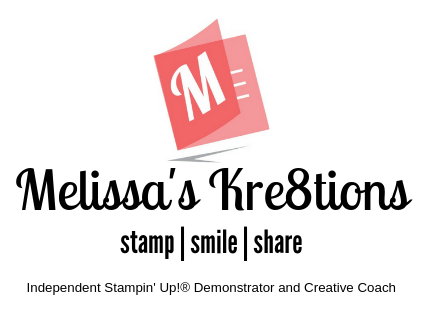 Join my TEAM, Melissa’s Kre8tors! Be a kit-napper, a Hobbyist, or a full on Business demo! Great time to sign up because you can add sale items AND Occasions Catalog items!!! Head over to my site and get signed up today! Don’t forget to use the current hostess code NU3P7YVK when you place your order to get a thank you card from me at the beginning of next month! Stamping Saturday 11/5 Session 2! Session 2 of Stamping Saturday was so much fun! We put together a card that I CASE’d from Mary Fish of Stampin’ Pretty and a box that I designed myself featuring a punch out window. The red, black, and white Christmas card features Santa’s Sleigh Stamp Set and Coordinating Framelits Dies. I also used some Basic Jewels Pearls. The Pool Party box uses the stamp set It’s a Celebration along with several different punches and of course a Window Sheet to create a fun see-through window. I hope you will join me for my next Stamping Saturday! Like my Facebook page so you can be notified when I post new events, such as my next Stamping Saturday. Don’t forget to use the current hostess code ZV27BCED when you place your order to get a thank you card from me at the beginning of next month! *This video was previously recorded during a live Facebook broadcast. All games and prizes are now closed. If you’d like to participate, please head over to my Facebook page. Stamping Saturday 11/5 Session 1! Stamping Saturday Session 1 was this morning and I was able to get the video edited and posted early! Yay! This was recorded LIVE over on my Facebook page and I have posted the replay to my YouTube channel. I’ll post Session 2 soon! Thank you to everyone that participated in Session 1 of Stamping Saturday over on my Facebook page, I had a blast showing off some samples and giving away prizes! This is a replay from my live broadcast on Facebook earlier today, so unfortunately, the games are closed. If you’d like to participate in the future, head over to my Facebook page and click like so you can be notified when I post and have live videos. Today’s project features a Thank You card with Copper accents and it’s just SO PRETTY! I love it! These were my thank you cards to customers who placed orders with me last month. Our second sample is for a Christmas tag and coordinating envelope. This is a quick and easy project that uses minimal supplies and is perfect for scraps! Customers that used my current hostess code last month all received a three pack of these tags along with the envelope.